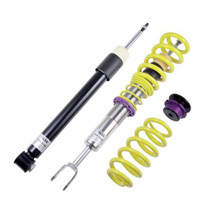 Looking to upgrade your E60's suspension with full height adjustability but don't want to kill your comfort level with conventional coilovers? KW have just what your looking for with "KW street comfort“ KW has produced a newly developed coilover suspension line which allows individual lowering with the best driving comfort possible. The lowering, depending on the application, is from 5-45 mm. Therefore it offers a perfect look, with the best possible driving behavior. Long distance, motorways as well as fast driven country roads will be a pleasure for every driver. Questions about these KW Street Comfort Coilovers? Our Modification Experts are standing by and available to help you, online or by calling 714-582-3330. ModBargains also offers expert installation and can install this upgrade for you. Call today!